Our mission is to offer transformational experiences that in turn benefit others in need. Core to our offering is the ‘Gift a little Soul’ program, in which part of every guest payment goes towards little souls in the Himalayas in need. It will give guests as chance to give a child a furutre in the form of housing, welfare or an education. The Garhwal English Medium School –GEMS– is a not for profit, free school for children living in the Garhwal region of Uttarkhand, India. The school opened on 1st December'2009 to provide good quality education in the Garhwal region of Uttarakhand. $20.00 pays for one child’s lunch time meal consisting of rice, lentil, vegetable and cereal for one week. $50,00 will pay for one child’s books for the year. $150.00 will pay for one teacher’s salary for one month. $300.00 will support one student for one full year and includes their uniform, books, lunch time meal, medical care, bus fare, and teacher wages. 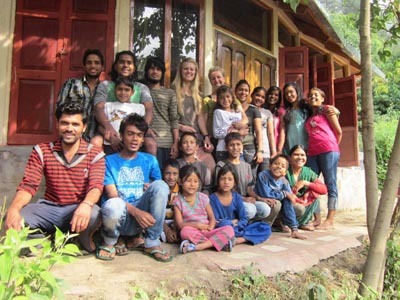 Ramana’s Seva Samiti provides quality education, proper nutrition, and primary healthcare to children from the backward and remote areas of this Himalayan region. Empowerment of women through education and training is also an important area this social grassroot organisation works for. It has over 60 children and a free English Medium School for 160 students. The classes in the school are from kindergarten to eighth grade. YES is a initiative by which you can donate or sponsor a child sitting anywhere in the world. You just need a heart. There are many ways you can contribute. Please feel free to contact us at Dewa Retreat.